Last updated January 4, 2016. In the following article we will address the main causes for being denied life insurance. However, the main point is that if you are concerned about being turned away or have previously been denied, give us a call today and let us help you find the coverage you need and want. If you have never been declined but are fearful of what may pop up on your exam, consider our article exam versus no exam life insurance. It might be your best choice is to choose from among the top no medical exam life insurance companies. Every Life Insurance application will have one of 3 outcomes: You will be approved, declined or postponed. Now we all know what it means to be approved. And typically, when an insurance carrier postpones an application, they will provide detailed information on how to move forward with completing the process. But what does it mean to be declined? Does this mean that you can never get life insurance? Were you denied by every insurance carrier, or just one? The answer to all three of these questions is that, you need to get a second opinion! willing to go the extra mile for their clients: you are more than an application, you are a valued client! (see our 4 Step Process for Getting clients with Pre-Existing Conditions life insurance). Tips For Acing Your Life Insurance Exam. You can view our complete list of pre-existing conditions and prescription medications by clicking the appropriate box below. #1. Lipids, Cholesterol and Triglycerides. Elevated cholesterol levels can often lead to a denial on life insurance as well as an unpleasant surprise for the applicant. Surprisingly enough, elevated blood pressure levels are usually NOT a reason to be declined life insurance. However, it is one of the top reasons for being approved other than applied for. See: Tips to acing your medical exam. #2. Glucose or Blood Sugar Levels. Elevated glucose or blood sugar levels are another silent killer to a life insurance application and typically a surprise to the applicant. For that reason we have put together two separate articles on diabetes. If you have diabetes then please see our article, Life Insurance with Type 2 Diabetes or Life insurance with Type 1 Diabetes. However, it is important to note that a life insurance denial with one carrier, may be an approval with another. This is why its important to apply with an agency that can “shop” your medical exam results with multiple carriers if need be. That way you shop the front end and the back end. Often times, clients will receive results indicating an elevated liver function exam, only to learn later on from their primary care physician that everything is normal. For this reason, if you have been denied life insurance coverage, its important to know which life insurance carrier denied you. For these clients we typically encourage them to reapply elsewhere with a new exam to get a better rate. #4. Hepatitis that is discovered on the life insurance exam is a decline. Now Hepatitis B or C that has been treated may be OK after treatment. But if you have just discovered that you have Hepatitis B or C, the insurance companies are simply going to deny you life insurance coverage until after you have received treatment. You still can qualify for life insurance with chronic hepatitis B or C but you must be under some sort of regimen for treatment. This is not a test for alcohol in the system. A few drinks here and there is not going to create a positive alcohol marker. A positive alcohol marker is run when liver functions are elevated and is used to determine if the applicant’s drinking is well above what is considered “normal levels”. A positive alcohol marker is a quick way to receive a life insurance denial. #6 Blood or protein in the urine. This can be caused by extreme physical exercise or kidney disease. It should always be followed up with an exam from your primary care physician and if it turns out to just be an anomaly, life insurance companies will often ignore the paramedical exam results as long as you have updated test results from you physician. For more on what underwriters look for you can read our article, What do life insurance companies look for in blood and urine samples? One of the leading causes of death, to what would otherwise be a healthy individual, is a motor vehicle accident. For this reason, multiple tickets, accidents, or DUI’s during a set period of time could lead some carriers to either deny your life insurance application or postpone your life insurance application until your DMV record is clean. This one is a difficult one, because insurance companies have set ratios based on income and total net worth of the client that they will insure up to. These ratios are basically the same across the board with all of the insurance carriers. Unfortunately some insurance agencies place additional internal restrictions that they have chosen to use as a cost saving mechanism which has nothing to do with the carrier themselves. For example: Some insurance agencies simply won’t write a term life insurance policy for someone who’s household income is less than $30,000. These agencies have made the financial decision to avoid those lower income households in an effort to reduce their own costs. Which is why you need to really know why you have been turned down. If it was due to low household income, find another agency such as TermLife2Go. Obesity is a hard one, but not all carriers will look at weight the same. This is one of the areas where life insurance carriers will vary the greatest. Knowing your actual weight and applying with the most liberal carrier for build requirements (your build is you height to weight ratio) from the start will be the number one determinant in getting approved at the best rate class possible when overweight. Don’t risk being declined or rated with an insurance carrier whose build requirements are too strict. Insurance companies subscribe to what is called the Medical Information Bureau. It is a report that is shared among the insurance companies sharing information about previous life insurance denials or approvals on other insurance applications. Its purpose it to protect insurance companies from applicants who may be lying about their current health conditions. Just because you have been previously denied life insurance does not mean you will be denied again. The takeaway from all of this is that you should always get a second opinion! 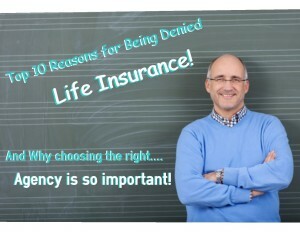 Thank you for reading our article, Top 10 reasons for being declined for Life insurance. If you have any comments, suggestions or questions please leave your feedback in the comment section below. We would need to know more about your situation, but in general, folks who have been diagnosed with Hep B will be eligible for coverage once they have been able to demonstrate that they are fully recovered (for at least 2 years) and that their liver is functioning normally. What if I applied to two companies at the same time? I didn’t realize I had a chance to get a policy except guarantee life insurance so applied for it but then an agent had me apply for a regular term policy. I didn’t tell them I had applied for the guarantee policy. Is that a problem? It’s not all that uncommon for individuals to apply for coverage with several insurance companies at once. It’s also not all that uncommon for folks NOT TO INFORM their agent that they have done this, so don’t freak out. You see, the main reason why life insurance companies want to know about the “other application is so that they can try and avoid “over insuring” an individual in the event that they decide to approve your application. This is because, in addition to having to be able to “physically” qualify for your term insurance policy, you’re also required to “financially” qualify as well. Now since all you’ve done is apply for a term life insurance policy and a guaranteed issue life insurance policy, it’s unlikely that you’ll jeopardize your “financial” eligibility limits which is why you’ll probably be fine. Just be sure that you inform your agent once you’re approved for coverage that you have applied for two different insurance policies and if you intend to accept both, be sure to inform that you will be taking both policies as well (if that is the case). How do mental health issues affect you ability to get insurance? Being diagnosed with a mental health issue is just like being diagnosed with any pre-existing medical condition. Some mental health issues will affect your chances at being able to qualify for coverage, while others may not. For more information, we would recommend that you either give us a call or visit our “pre-existing medical condition page” where we discuss a wide variety of medical conditions in further detail. How long does it take for MIB to receive records and update my file after a decline for life insurance? I received a decline last week after a medical exam. I applied with a different company this week, and I am confident that I will be approved for coverage, as long as they don’t have access to the records from that exam. Would my data already be updated? I stated that I had not previously been declined for coverage in my application, and now I’m wondering if they will see that decline in my records. Your question brings up an important issue, in that you really ought to be as honest as possible during a life insurance application. This is because, if it is discovered, after the fact, that you “materially” misrepresented yourself during the life insurance application process, the insurance company may have a legitimate “cause” for denying your life insurance policy claim after your death (meaning, that you beneficiaries would not be paid a death benefit)! Additionally, simply because you have been denied by one life insurance company for a particular reason, it does not mean that you’ll be denied by all life insurance companies for that same reason. However, if you have multiple denials on your MIB report indicating a history of “misrepresenting” yourself, in general, life insurance companies will tend to “err on the side of caution” and simply deny someone who otherwise would have been eligible for coverage. In cases like these, your actions rather than your current health status will make you ineligible for qualifying for a traditional term or whole life insurance policy. So… rather than focus on how you can potentially “fool” a particular insurance company, we would encourage you to pursue a company that will actually insure you despite any “pre-existing” conditions. Lastly, while we’re not 100% sure when an MIB report will be updated, our past experiences tell us that the MIB is updated pretty regularly. We know this because we have had folks get denied coverage with us, simply because they didn’t inform us about previous denials on their MIB report. In some cases, they were denied months ago, in other cases they were denied days ago. My ex husband died in 2014 suddenly and left my son life insurance money . We consulted a financial aid advisor as to the best avenue to put the money away , so he will have something to start his life after college. He suggested that he buy life insurance and at any time he will be able to take out the money and we will still have like insurance. I asked him at every meeting to confirm this and he said that to just call him and he will be able to take out the money. When my older son became a agent for Prudential, his mentor immediately wanted to see the policy and what we found out was shocking. This agent put my son’s $150000 in a 10 year annuity that pays out the $900000 life insurance policy for 10 years at $15000 a year. And if we take out the money after 10 years that will void the policy. So basically the agent made a huge commission and my son won’t be able to access his money for 10 years and his money would have no growth. Is there some kind of ethics law that controls agents from taking advantage of naive ignorant people. My son was 18 yr old a college student, no job, living in our rented apartment. We are a low income family that worries from month to month if I can pay my bills. That’s a tough one, what we would suggest that you do is contact the agent that wrote the policy as well as the state department of insurance for the state that you live in. Perhaps by contacting both parties, you might be able to come to an agreement that would make all parties happy. The problem that we see is that your son was 18 years old at the time (a legal adult), and the policy isn’t a fraudulent one, it’s just one that isn’t the best for him. I have hep c and liver fibrosis and have been denied according to the letter a ultrasound in 2015. I have been denied harvoni which would cure me and still I am in no treatment. I have been told I have a plop in my gall batter but noting been done for that either. What would be my next step? It sounds like you might need to consider looking at some Guaranteed Issue Life Insurance products, but they will only provide about $25,000 in coverage. Why don’t you give us a call so we can learn a little bit more about your situation and see which life insurance companies have already turned you down. I am overweight and I have been in one car accident. Are these two reasons enough to deny me life insurance? Or is there likely something else? All of my levels came back normal. The car accident by itself shouldn’t be an issue with regards to being approved for life insurance, provided your aren’t still receiving treatment for any injuries and the accident didn’t involve alcohol. As for your weight, we would need to know exactly what your height and weight ratio’s are. Why don’t you just give us a call when you have a moment and we’d be happy to go over all of your options with you. Can my mother take a life insurance then I become the premium payer hence she is not working? Yes you can be the policy owner and payee on your mother’s policy, we would just need to make sure that she can qualify for life insurance and then have you be the owner of the policy. Just give us a call when you have an opportunity and we’ll be happy to discuss what options will be available for you and your mother. Why are underwriters so mean and degrading to people they never met? Do they have a narcissist complex? We’re not sure if there’s a good answer to that, but in our experiences we’ve never really encountered a situation where an underwriter was “mean”, it’s more of a “cold” analytical approach where they’re just focused on numbers and statistics rather than individuals. But it’s important to remember, not all insurance underwriters our bound to the same statistics or numbers so if you would like to get a second opinion on your situation, feel free to give us a call and we’ll see what we can do! Assuming that you have a life insurance policy in place, and you’ve decided that you want to donate a kidney “in theory” this should not have any effect on your existing life insurance policy. That being said however, since we do not have access to your existing policy and aren’t able to read what your actual policy states, we would advise that you give your existing insurance carrier a call and ask them directly. Previous Post: Do You Live in One of the Most Adventurous States?